After an 81-70 Hawkeye Men’s Basketball win over rival Nebraska on Sunday afternoon at Carver Hawkeye Arena, $2.5 Million was how Hawkeye Head Coach Fran McCraffery opened up his post-game press conference. “I just want to say how proud I am of our students” an emotional McCraffery said in his opening statements, “without question that’s the most important thing that happened this weekend” Coach McCraffery was talking the money raised for Dance Marathon. Without a doubt Coach McCraffery is correct, and to all my fellow Hawkeye’s that participated you should take pride in this amazing feat, with that said, a basketball game was played on Sunday and for college basketball fans it does hold some significance. 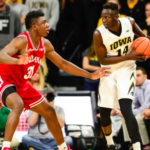 The first half ended on a high note as Senior Guard, Peter Jok, hit a baseline jumper with less than a second left to give the Hawkeyes a 38-36 lead as they went into the locker room. Jok, who started after missing the last two games, had a relatively quiet night putting up a season low seven shot attempts making just two of them. He finished with 12 points after making some key free throws down the stretch. When asked after the game, Jok said that “needed a game or two to come back” from his back injury. With the way this young team has been playing recently, a game or two shouldn’t be a problem allowing the Big Ten’s leading scorer to get healthy. Early in the second half Jordan Bohannon stepped back, as we are becoming more and more accustomed to, and he drained a three. Not only was the three significant because it helped the Hawkeyes out of a slow start, but it set a new record for made three pointers by a freshman in a Hawkeye uniform (56). “He plays at his pace, you can’t rush him, and he knows exactly what we want done” McCraffery said after the game about Bohannon, and knowing exactly what needs to be done is something that is going to be important if this team wants to have any chance of making into the “big dance” come March Madness time. Four of the Hawkeyes remaining games will be played on the road. After winning on Sunday the Hawkeyes move into fifth place where they are tied with Michigan State (who is one of the remaining games) in the Big Ten and with the way this college basketball season has played out, the Hawkeyes should have a chance to finish in the top half of what is considered the toughest conference in basketball this season. To make the NCAA tournament they will definitely need to know how to finish. 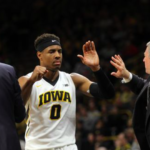 Iowa plays again on Wednesday as they take to the road to face a very tough Minnesota team.